I put this on top of W7 Pink. I think it works well with the pink base! Although I was begninning to think - another glitter!!!!!!! The last 3 photos were taken with the flash. This is easy to use and easy to apply. Just sprinkle over a wet nail and tap off the excess. I usually have a little tub that I do it over and tap the excess into then - then I can pour the rest back into the bottlle! It's a nice holo blue glitter with lots of sparkles. I put a top coat over this, but didn't get photos as the top coat dulled it down and it didn't look good at all. My Personal Rating = 6.5/10 - not so keen on this one! 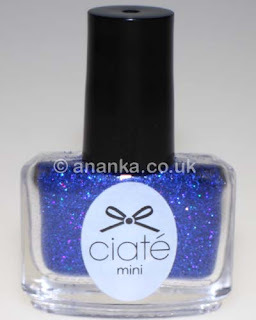 Great colour combination and what a gorgeous blue glitter. I love the combo - and it sure is super glittery! Lovely glitter but Ciate should have put at least one in a clear base for a bigger surprise. These go so well together ~ love this look! What a lovely sparkly and great coloured glitter!